The 1st Patented Brushless Paw Wash! Fast, gentle & the most efficient way to keep your dogs paws clean & healthy. The unique hour glass design creates a vortex of cleaning solution scrubbing away dirt and mud in seconds - helping remove bacteria and alleviate allergens. The Paw Wash is also safe to use with medications. Follow the The Paw Wash with the quick drying Paw Wash Mitt! Use at home or on-the-go. Perfect for traveling, hiking and trips to the dog park. Use for protecting and healing injured dog paws. Brushless means there aren't any bacteria holding brushes that can irritate your dog's paws. Our Brushless Paw Wash is not only the best way to keep your dog's paws clean, but it is the perfect solution to use for keeping your dog's paws healthy! Remove the center cap that says "Lift." Fill the Paw Wash with a few drops of pet soap and fill it with water to the fill line (make sure to leave the yellow ring on that holds the black squeegee in place). 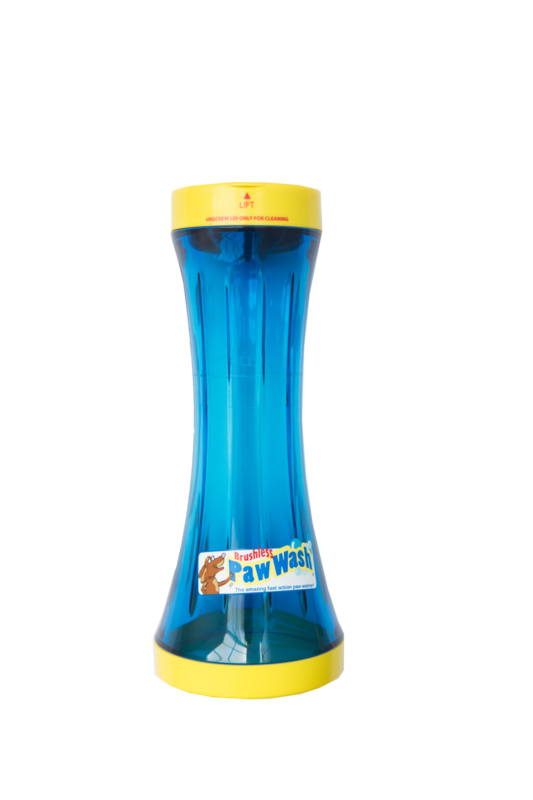 Insert your dog’s paw into the container to create the water bursting suction action by moving the Paw Wash up and down the paw. Remove the paw and see how our unique squeegee top helps keep the water droplets inside. Then just pat the paw dry with our microfiber Paw Wash mitt. Repeat for each dirty paw as listed above. (Typically one should be able to wash all four paws with one filling).